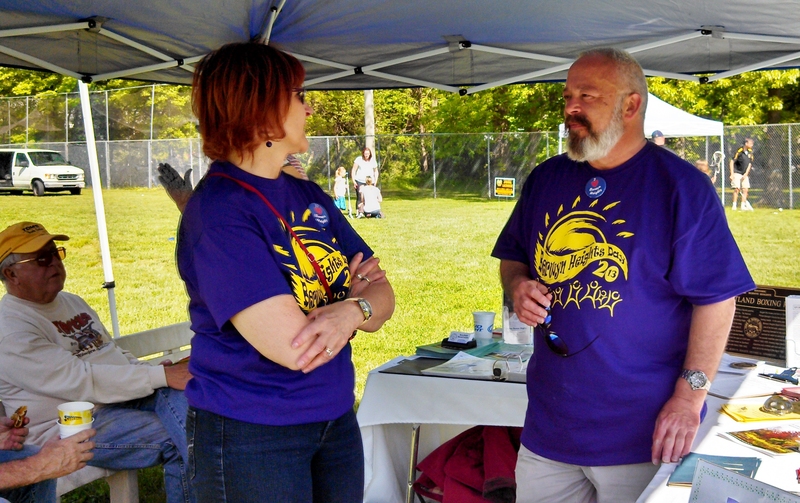 By 11 am on a bright May 4th, 2013, the Historical Committee’s tent was set up for Berwyn Heights Day. Posters, brochures and the mockup of the Sportland Boxing Ring marker were on display. Many visitors stopped in, including some former residents. 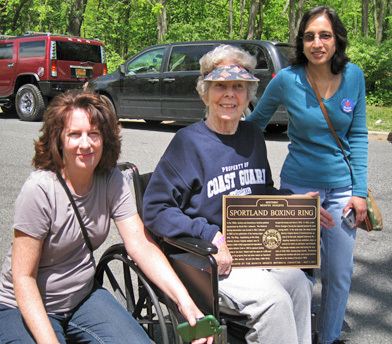 The BHHC was very pleased that Maria Snoddy, who grew up in Berwyn Heights and now lives in Greenbelt, accepted an invitation to attend the Sportland marker dedication ceremony. Mrs. Snoddy is a grand-daughter of the former owners of the boxing arena, John O. and Maria Waters. She made the trip despite being in a wheelchair, accompanied by her daughter Laura Collier. Talking with Sharmila Bhatia, Mrs. Snoddy recalled that her grandfather was quite a character. He tried his hands on many things. On the Sportland property, there were grape arbors and from the grapes Waters made his own wine. He hired men from Lakeland (now Lake Artemesia park) to help him work his large garden. Mrs. Snoddy also shared some interesting facts about her own parents, Ned and Edna Waters. The home they built next to Sportland on 60th Avenue has floor trusses that came from FDR’s inauguration stand. The lumber was sold as scrap at Hechinger’s. Waters knew the lumber was coming into the store and made arrangements to purchase it. Ned Waters was elected to the County Council in 1950 and served for one term. His name and those of the other council members who served at the time, were memorialized on a plaque installed on the Woodrow Wilson bridge, when it was built. The plaque, however, was removed during the recent reconstruction.